travelling | Ashlie's Cancun Blog and other stuff! Another year has come and gone and once again hubby and I will be celebrating by eating pozole and drinking tequila but this time we will be spending it with his family instead of hitting the Zocalo. Viva Mexico!!! 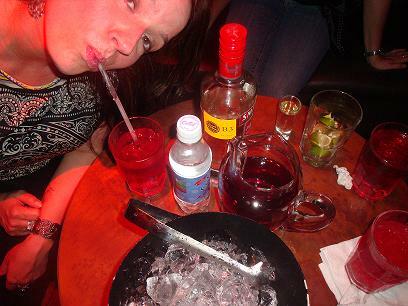 via Ashlie's Cancun Blog and other stuff! How about visiting a cenote on your next vacation? When you hear people discussing their vacations in Mexico you will often hear them describe how beautiful the beaches are, the turquoise water and white, soft sand but what you may not hear them talk about as much are the thousands of cenotes that can be explored either on your own or by joining a tour group. 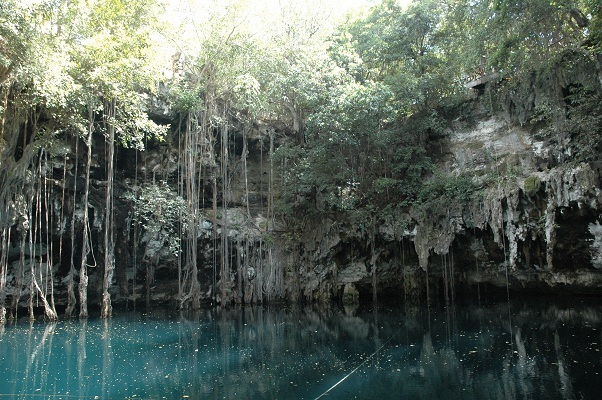 A cenote is simply asinkhole that is most often surrounded by rocky edges. 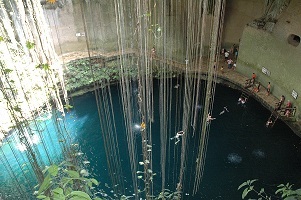 There are above ground sinkholes as well as subterranean cenotes and the water is usually very clear. Many Mayan settlements were based around cenotes as they provided an essential water source for the people. Chichen Itza is one of the more well-known cities that settled near these natural wells. Mayans also believed that these sinkholes were gateways to the afterlife and so they played important roles in theirMayan rites. In my 16 years in Cancun I have visited many cenotes and I continue to explore new ones whenever I get the chance to do so. I have always loved the ocean but I am particularly fond of these magical, fresh water oasesperhaps because they bring back such fond memories of time spent at the numerous lakes, found in B.C., whilst growing up in Vancouver, Canada. Some of my favourite cenotes are located close to home in Quintana Roo and some others are several hours away in the Yucatan state. Cenote Cristalino, which is about 15 minutes south of Puerto Aventuras, is probably the first cenote that I ever visited over 14 years ago. When I first started going very few people knew of its existence. In fact, on most occasions when I went there with friends we would be the only people there .It was our very own private oasis. Through the years that has changed with the advent of major development in the Riviera Maya and “cenote tours”. “Cristalino” is no longer just “mine”; however, it still remains a beautiful spot which I visit often especially when friends are in town. In the Yucatan you can explore such amazing watering holes like the open air Cenote Il Kil and Cenote Yokdzonot as well as Cenote Dzitnup and Cenote Samula which are both subterranean cenotes. On my first trip to Il Kil we left our SUV in the parking lot just as two very large tour buses pulled in and a huge group of tourists descended from the buses, cameras in hand,rushing towards the very same entrance that we were heading to. We all handed in our tickets and were guided through the souvenir store en route to the cenote where luckily we lost about half of the people from the buses as they were waylaid by sales people trying to peddle ornaments, blankets and otherkeepsakes. We hurried along trying to lose the herd but quickly realized that the cenote was already full of people who had arrived on earlier buses. As we approached the steps leading down to Il Kil we stopped to admire the view from above and I was left speechless, which for anyone whoknows me is quite something. I had seen You Tube videos and photos of Il Kil before but they couldn’t even begin to compare to the sight before us. The crystal blue water, surrounded by rocky edges and vegetation was truly magnificent. We made our way down the steps until we arrived at the cenote’s edge where we joined a crowd of people. We stowed our belongings and dove into the cool water. As I floated on my back I suddenly became aware of a silence that enveloped the submerged cavern. I looked around and to my delight realized that the majority of people had left to continue on their tour. I basked in the silence and swam under the small waterfalls letting the water crash down over my face. As I surveyed the area around me I couldn’t imagine a more beautiful place, so serene and lush with vegetation and natural beauty-a true Garden of Eden if there ever was one. Yokdzonot is very similar to Il Kil but without the crowds as it is relatively new to the tourist scene. It is run by a small group of Mayan women to help support their community of 850 people. It boasts an estimated depth of 45 meters and is 40 meters across and about 22 meters from the rim to the water. On our last visit there we were the only people in the water. Need I say more? Finally, the cenotes Dzitnup and Samula, which are by no means less breathtaking, are located in Valladolid, a quaint colonial town about 1.5 hours from Cancun. Both of them are below ground and offer a different experience than the aforementioned cenotes. LED lights enable you to navigate the stairs down to the subtlety lit caverns where you are greeted by an eerie silence with cave walls that echo your every word. 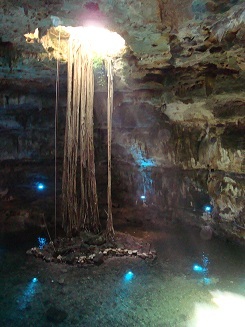 Samula, though smaller, is less crowded (for now), and there is an opening above that lets in rays of light that shine down on massive tree roots, which in search of water have taken root in the small island in the center of the cenote. As you swim through the mineral infused water you cannot help but feel blessed to be a part of such relatively untouched natural beauty. I often experience a great sense of peace and feel connected to “something bigger” when I visit these places. 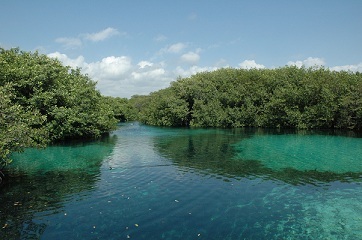 There are so many cenotes that one can visit while exploring southern Mexico. I have but only scratched the surface with this article. Below is a small list of some of the cenotes that I have been to over the years and which I recommend that you consider exploring on your next visit to Quintana Roo and the Yucatan. August 31st Hubby, Mom and I woke up to blaring alarms set for 4am so that we could make the long journey home to Cancun after spending 19 fantastic days in my hometown of Vancouver with family and friends. We struggled with our luggage which now consisted of 2 suitcases, 1 duffel bag and a box thanks to various end of summer sales. Trying not to wake everyone in the building we managed to load everything into the elevator and then into my Mom’s low slung space- challenged car. We arrived before everyone else and after an uneventful check-in and a teary farewell with my Mom we continued on to customs as passengers going to Mexico via the States (Houston in our case) clear American customs while in the Vancouver airport. We cleared customs without a hitch.So far so good. We parked ourselves in the food court and enjoyed our pre-packed breakfast and then walked over to the sitting area by our gate. 10 minutes before boarding time I pulled out our documents bag (a zip lock freezer bag)) in anticipation of our imminent boarding and my whole world came to a screeching halt! I saw 1 passport (Mexican) 1 FM2 (my Mexican immigration papers) 1 pen for filling out forms but NO Canadian passport. A cold tingling sensation shot through my body like a rocket and settled in my stomach. We frantically searched through our backpack and computer cases several times until we had to face the awful reality that my passport was gone. I informed the Continental Airlines agents who radioed around while I frantically retraced my steps but still no passport. By now I was on the verge of tears and when they informed me that my luggage had to be deplaned and that Cesar should go on ahead my face crumpled. I bid another tearful farewell this time to my husband and watched as he disappeared down the gangway. I was now left alone with Louise, a very kind Continental rep, who calmed me down and told me that once I got a new passport they would put me on standby status for another flight the next day to avoid having to pay almost $400 in change of ticket fees as well as the fare upgrade difference. The following flight was fully booked but not overbooked and she was pretty confident that I would get on. Shell shocked I called my Mom at home for a ride and made my way out of the airport passing through Canadian customs and baggage claim. By the time my Mom picked me up she had a plan.God bless her! We headed straight to the passport office which, incredibly, was empty thanks to all the rain that morning. I picked up some forms, had photos taken,hot footed it over to an old family friend, who used to be a lawyer, and asked him to be my guarantor, and then his legal colleague kindly signed the declaration of loss form as it had to be notorized.We rushed back to the Canadian Passport office ,through the incessant rain in my now very wet Cancun ready sandals, with everything completed and paid the regular fee as well as a “fast-track” fee (grand total $157). I informed my two personal references and family friend to expect a phone call from the passport office within the hour as they would be checking me out since I was requesting a passport in 1 day. I was asked to return at 3pm and maybe just maybe my passport would be ready that day.It had been a very long day so far and we were wet from all the running around so we made our way home for lunch and to wait. Bang on 3pm we were at the passport office again where to my absolute joy I was handed a new passport and treated to a small lecture about taking care of this official document. The afternoon was spent at home working on my computer, having a quiet dinner and going to sleep early. 4 am rolled around faster than I would have liked and I woke up feeling like I was stuck in Bill Murray’s “Groundhog Day” flick. I showered, lugged my box, my suitcase, and computer down to my Mom’s car and off we went to the airport in the dead of night…again! I met with Louise and I was given standby tickets, I said goodbye to my Mom, cleared customs and then waited at my flight’s gate in hopes that I would be going home today. This time my Mom waited on the other side just in case….. Aren’t Mom’s just the BEST?? After the flight had boarded…everyone showed up 😦 I was once again escorted down to Canadian customs but only after Saint Louise (my new name for her) booked me on tomorrow’s flights no more standby for this girl. She must have taken pity on me after being present through most of my ordeal. So now I sit here still at my Mom’s place, sipping on a glass of wine and sharing my tale with all of you, not quite able to fully relax and feeling like I am not entirely in Vancouver but somehow still in transit. We are going out for an early dinner at the local Thai restaurant and then it will be another early night and early start but this time I hope I will finally get off this merry-go-round and make it home tomorrow night. Have you ever lost your passport? 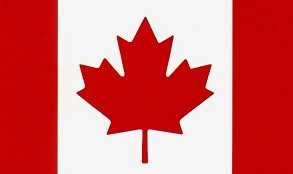 This Ex-Vancouverite is Canada bound…. Once again August has rolled around and this Cancunenese is heading back to Vancouver with her hubby for a few weeks of vacation! To sum up how I feel in one word–EXCITED!!!! As the weather keeps getting hotter and hotter and more humid here it is time to blow this popsicle stand and go back to my hometown. As always I have organized a jam-packed schedule of fun visiting family and friends and let’s not forget the gastronomic tour of all the great restaurants that Vancouver boasts. I have visions of Greek food, incredibly fresh sushi, Vietnamese noodles, dim-sum, real Chinese food, Indian food and all of the other tantalizing dishes that Vancouver cuisine is famous for. and….well you get the picture!! 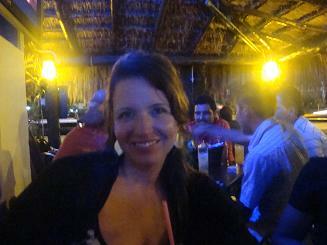 Wrapping up Wendy’s Whirlwind Trip to Cancun I will pick up where I left off and start at The Blue Parrot. I believe my closing words were ” Oh what a night!” We started on the hip hop/top 40 side so that Wendy could see the fire show which as always is very entertaining. 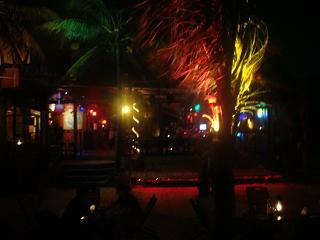 Blue Parrot bar is part of a hotel that is located on the beach. They have two sides with very different music. I personally like the techno, progressive side but when visitors are in town we start out on the other side so that they can enjoy the show. Once the show was over we went over to the “good side” 🙂 where I had reserved the VIP area and we ordered a bottle. Dancing shortly afterwards commenced and though it was very hot we barely sat down for more than a minute throughout the whole night. My husband eventually gave up and went back to the hotel leaving Wendy, Erika, Freddie and myself. Shortly before dawn we lost sight of Wendy only to find her on the other side of the roped off area of Blue Parrot heading down the beach. We caught up to her and I don’t know who it was who first suggested it but we were all of sudden swimming in the ocean. We, girls, stripped down to our underwear (thank goodness I wasn’t wearing a thong that night) and Freddy went in with his jeans on which can only mean, I assume, that he was going commando. I vaguely recall lamenting as I hit the water ” Oh my Calvin Klein bra..I hope the saltwater doesn’t destroy it” We had a great time splashing in the waves and then as the sun began to slowly rise we stopped someone staggering by and asked them to take some photos. After pulling our clothes on over sandy, wet bodies we made the uncomfortable walk back to our hotel where we crashed until check out time. A few hours later we went to Mamitas beach club for a late carbohydrate filled brunch and then to Kool Beach Club for the day. After renting our beach chairs and palapa we took a nap and then awakened with renewed energy. Kool has a great DJ who pumps out fantastic tunes all day. We had a very reasonably priced mid afternoon snack of sushi and drank LOTS of water. As the day came to an end my husband, Freddie and my energy levels were waning fast but Wendy and Erika wanted to do some MORE shopping so we planted ourselves at a small restaurant and waited until they were finished. When they finally met up with us we made our way home to Cancun, watched half a movie and fell into a deep sleep (coma) until the next morning. On Sunday we joined some good friends of mine at the beach at Puerto Morelos where Wendy continued on her quest for the ultimate tan. 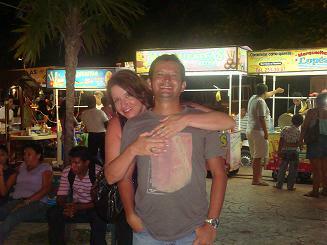 That night we went for Italian food at Parque de las Palapas https://ashlied.wordpress.com/2009/11/24/el-dpa-bistro-in-cancun/ then walked around the “parque” so that Wendy could experience some local flavour. Monday was spent chilling by my pool and on Wendy’s last full day she wanted to finish up her shopping so we went to a local market, Market 28, and then to the beach again.For her last night some of my friends joined us at Mocambo for dinner, a seaside seafood restaurant in the Hotel Zone, where we had a great meal. On Wednesday we took Wendy to the airport and bid her farewell but not before we had to re-pack her suitcase in the check in line. I had brought a “back up bag” just in case and sure enough Wendy’s suitcase was overweight so after frantically re-packing and lots of hugs we watched as Wendy disappeared up the escalator to the security area. 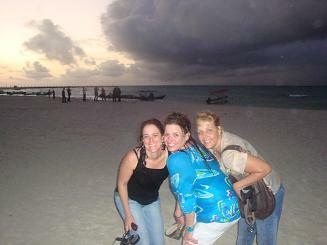 That night we went to Muellecito https://ashlied.wordpress.com/2010/02/02/dont-miss-out-on-el-muellecito-cantina-marisqueria-in-cancun/ with friends and shared a bottle, appetizers and lots of laughter.Our night wasn’t over yet so after dropping off the menfolk 🙂 we went out dancing again! Did I mention that Wendy and I used to be “dance buddies” when I lived in Vancouver? On Thursday I had some pressing work matters to attend to so my friend Erika kindly offered to take Wendy to The City Beach Club for the day so that she could continue to work on her tan. They had a great time eating sushi and sipping on fruity drinks. 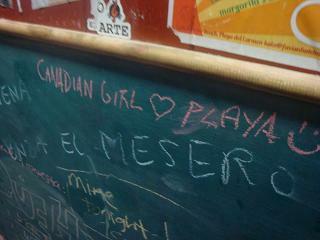 On Friday we set off for Playa del Carmen for the night. We had booked a nice little suite online for a great deal at the Tukan Hotel and two of our friends would be joining us later that day for the night as well. After checking in we had lunch at the Tequila Barrel and did some shopping and then relaxed by the pool before getting ready for the night.We strolled down “la quinta avenida” (Playa del Carmen’s main thoroughfare) for more shopping as Wendy had a “list” that she was working her way through for gifts for people in Vancouver as well as for herself. Wendy has great taste in jewellery and she was enjoying looking at all that Playa has to offer for the discerning shopper. I must backtrack for a second before I continue on to mention that over lunch we had discusd jewellery and I had told Wendy about all the beautiful jewellery that I once had but that had been stolen in my last apartment. 😦 To this day it still angers and saddens me as I “lost” a very special ring from my Dad that I had helped to design. I was given it when I turned 18 and my two younger sisters also received the same ring on their 18th birthdays. Aside from that ring I also “lost” a beautiful emerald ring, a tanzanite ring, and several other pieces. So as we were diving in and out of stores Wendy declared that she was going to buy me a tanzanite ring for my upcoming birthday in June and that she wouldn’t take no for an answer. I unsuccessfully tried to talk her out of it and then graciously accepted after we had picked out the most perfect deep blue tanzanite ring. 🙂 Thank you Wendy…your incredible generosity will not be forgotten! 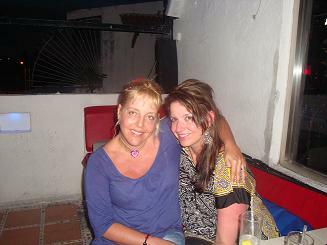 We met up with our friends and had a great dinner on the beach at Fusion http://www.fusionhotelmexico.com/bar-and-grill.html where Wendy left her “mark” on the bathroom wall–they provide you with the chalk so it’s okay 🙂 Then it was off to The Blue Parrot for…you guessed it more dancing. I will leave off here for now as our experience at Blue Parrot requires more than just a few sentences I can only say….Oh what a night!!! As I mentioned in one of my previous blogs a good friend from Vancouver came to visit us for 10 days. We had decided that 7 days was not nearly enough time and that 10 days, if she could manage it, would barely give us enough time to see some sights and get some quality girlfriend-time in before it would be time for her to leave again.She arrived on May 14th at 6:30 pm hot and tired from a long day of travelling but ready for whatever we had in store for her. She was worried about the weather as the forecast for 10 days was stormy, rainy and generally grim but we decided then and there that we wouldn’t let the weather get us down and that we would enjoy ourselves no matter what! When I asked her what she would like to do over the next 10 days she told me simply “You decide, I trust you, I have to make decisions everyday at my workplace and I don’t want to make any here. I am on vacation.I will let you know if there is something that I don’t want to do” So based on that conversation I started making plans…..
After we dropped her bags off at my place and had had a Jack & Ginger (thank you Wendy for bringing Jack AND Crown Royal) we went for dinner at Pericos. A very touristy dinner spot on Yaxchilan, a little overpriced but they have waiters that sing and dance and drag you onto the dance floor while they pour tequila slammers down your throat while the band plays “Tequila!” A great way to start off a vacation me thinks! 🙂 We had an early night as Saturday was the only day that forecast a possibility of sun and Wendy wanted a tan and to hit the beach. We got up early picked up some octopus and conch ceviche from El Timon de Cancun on Uxmal and cut up some fresh fruit, filled some water bottles and packed our cooler and set off for Puerto Morelos for a day at the beach.The sky was clear, there was a refreshing breeze and the water was warm. We returned with sun-kissed skin ready for the evening. We headed out for tapas and wine at El Rincon de Vinos in Parque de las Palapas with some of my friends and then headed to Dubai Terraza where we danced until they closed and then we went to Red until the sun came up and then it was home where we collapsed into our beds. Later that day (Sunday) we awoke to rain (thank goodness) and ordered pizza had a dip in my pool and watched movies. 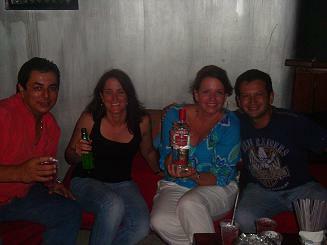 Wendy had been in Cancun 48 hours..we still had 8 days to go….would we survive? Who wants Eggs and Soldiers for breakfast?